Recently, a few buddies and I got together to try to make our own bacon. 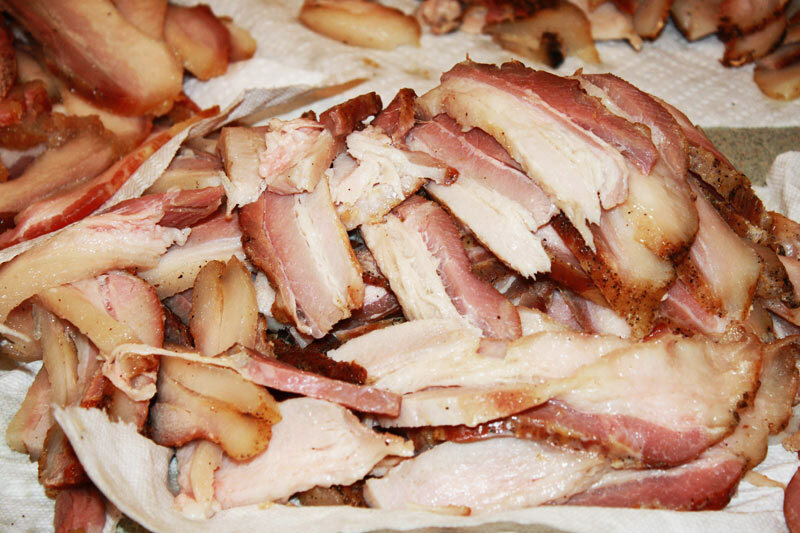 Below is a brief tutorial on how to make your own bacon at home, as well as some recipes and tips from our own experience. Ask around at local butcher shops. Many will carry pork belly. You are looking for pork belly that still has the skin on. The thicker the belly, the wider the bacon, so be picky and ask for the thickest, best looking belly they have. This is about 12 lbs. of pork belly. If you live in southcentral Alaska, you can get pork bellies from Mike’s Quality Meats in Eagle River for $2.79/ lbs. They’re thinner cuts than I would like, so I may look around to see who else carries pork belly. Slicing the belly in half, you can see that it looks just like bacon! Find a recipe for curing your pork belly. We used five different recipes, all with good success. For now, here’s a typical bacon recipe to get you started. We will be adding more recipes as we refine our technique! 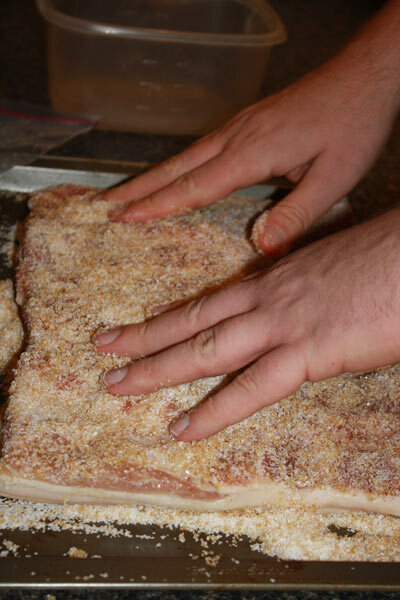 Make sure you rub the salt and dry ingredients into every crevice and piece of the pork belly. This will ensure an even cure. Make sure to work the dry spices and salt into every part of the pork belly. 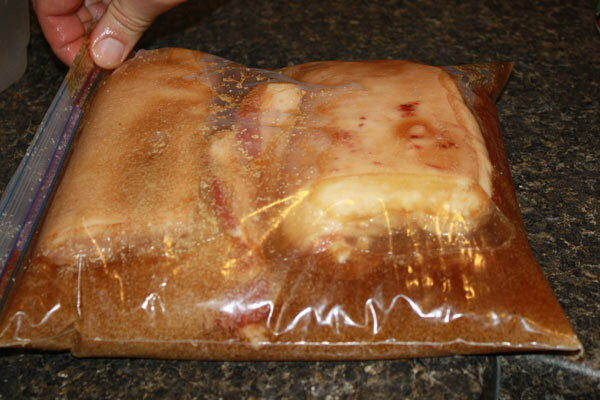 Step 4: Put the pork belly into a large ziploc bag. Add liquid ingredients if relevant. You'll likely need to cut your pork belly into more manageable chunks. Many recipes call for sodium nitrite or “pink salt.” Sodium nitrite is preservative to help prevent botulism. However, botulism in bacon is exceedingly rare, if not impossible, if you don’t let your meat sit out and get warm. Today, the nitrites are really only used in bacon to give it a pink hue. It’s up to you whether you choose to use sodium nitrite in your bacon. Because we take really good care of our meat, we don’t use it. In my mind, it sort of defeats the purpose of homemade bacon. Plus, sodium nitrite, when heated to high temperatures, forms carcinogenic nitrosamines. Step 5: Allow your pork belly to cure for 3-7 days. Flip the ziploc bags every day. The salt will begin to draw out the liquid in the pork belly, and you’ll want to ensure that it does so evenly. Check the bacon every day for firmness. You want a good portion of liquid to escape the bacon, but you don’t want the bacon to become to dry or salty. It’s an inexact science. Feel the bacon to see if it’s substantially firmer than when you started. That’s a good indication it’s about ready. Step 6: Rinse off your meat. Slice off a couple pieces and try it out! Take the pork belly out of the fridge and rinse off the cure from the meat. After a week of curing, your pork belly is now bacon! You can eat it now, or you can (and should) smoke the bacon to add additional flavor. However, you should try a couple of slices to see how salty your bacon is. 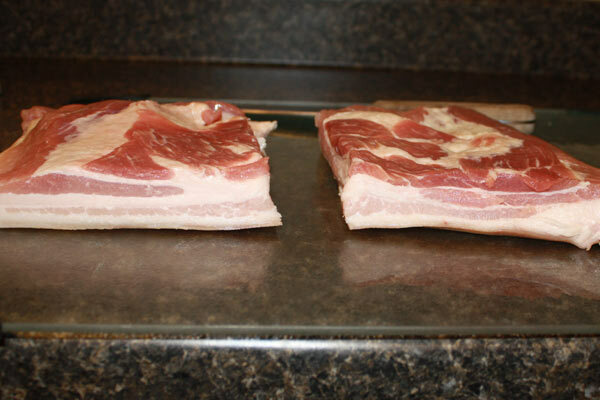 The end of your bacon slab will be saltiest, so slice off the end of the slab and then slice off another piece of bacon. This is how your bacon is going to taste. 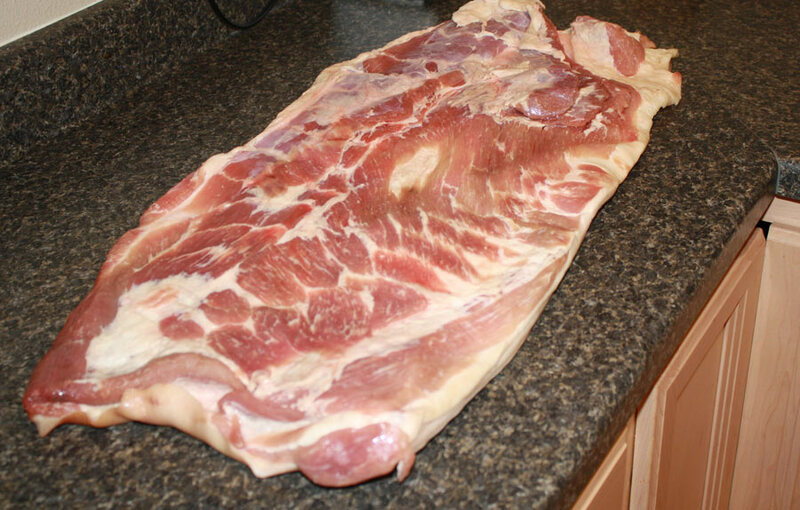 If it is too salty, soak the bacon slab in water for a hour or two. Try another slice until the saltiness of the bacon suits your tastes. Smoking your bacon is easy. 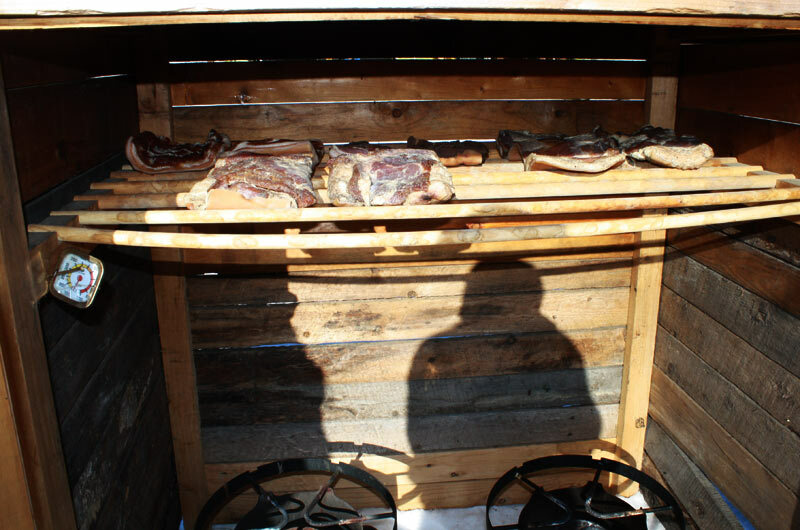 You can use a smoker or simply an outdoor grill. We had the benefit of a big smoker, but if you want a tutorial on how to smoke your bacon using a grill, go here. Cured bacon awaiting smoke. We used hickory pellets to smoke ours. 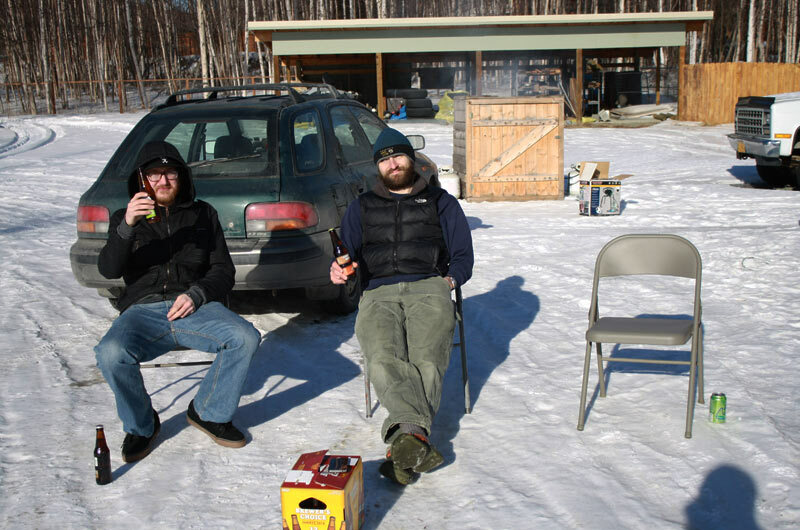 SPRING BREAK 2011! It's a hard job waiting for the bacon to smoke. Remember, bacon is cured, not cooked. You want the internal temperature of your bacon to reach 150F, but not much higher. The air temperature in your smoker/grill should not exceed 200F. If it gets too hot, the pork fat will begin to melt, leaving you with less bacon! After the interior of your bacon has reached 150 F, take it out of the smoker. Allow it to cool, then cut off the rind (pig skin). 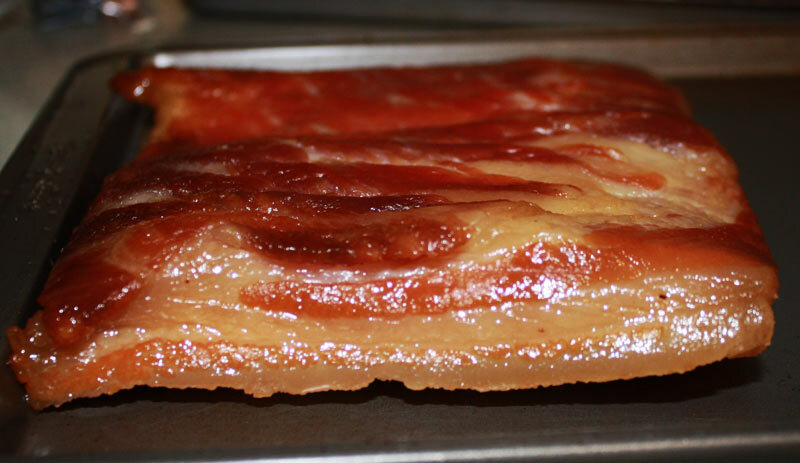 Put your bacon slab in the freezer until it is firm, to make it easier to slice. Slice the skin, or rind, off of your bacon slab. The bacon after it has come out of the smoker. Beautiful. Step 8: Slice, package, and enjoy! Slice your bacon into strips. Make sure you are slicing the right way: if you imagine the belly still on the pig, you would cut vertical slices from front to back. A delicious pile of meat. OMG Eric, my dad and I have been talking about do this for a long time. that price for the pork isn’t too bad, we may have to stop by Mike’s and stop talking and start makin bacon. Your statements on sodium nitrite are SERIOUSLY incorrect and dangerous. Nitrites are NOT simply used for a pink color or to kill botulism. It is used to kill all the different forms of bacteria on food including the food spoilage bacteria that are on all meat. Many food spoilage bacteria grow well even at refrigerator temperatures. Pathogenic bacteria can also grow at refrigerator temps also they take as much as 38 hours to double at 32 degrees while at 80 degrees they double every hour and at 90 every half hour. (I realize your not letting the meat get to those temps but it shows the exponential growth as temperature rises. Some people reading your article might have older fridges that are operating above the critical 40 degree temp which is the start of the “food danger zone” and your suggestion to not use sodium nitrite is dangerous). Pathogenic bacteria DOES NOT just mean botulism. It also includes the very dangerous Staph, E. Coli, Salmonella, Listeria, Bacillus cereus, and others THAT ARE VERY COMMON IN HOMES. To an extent, I agree with you. Food contamination is nothing to mess around with. However, a lot of current academic research confirms that nitrate, nitrite, and nitrosamines are correlated with cancer. In fact, a study (linked below) suggests that eating cured meat is not only linked to cancer, but also stroke and cardiovascular disease (granted this may be from the amount of fat most processed meats contain). Other recent studies show cured meats are correlated with increased risks of colon and lung cancers. To me, it’s a choice between two evils. I take enough care with my preparation, curing, and storage that I feel way better feeding it to my kids than the stuff one can purchase at the store. If common sense is used, and bacon is frozen or properly refrigerated after smoking, I would argue the risk of contamination is nearly zero. I found your page while trying to find which way to best slice bacon. I am on my second batch and wondered if I sliced it wrong the first time. I find it difficult to slice thin enough and need to invest in a used meat slicer. Anyway, as I was reading, the question of nitrite came to mind. then I read the replies and realized I was not alone. The other thing (pesky bugs aside) I have read about is that without the nitrite, the pork belly has more of a “ribs” type taste as opposed to a true bacon flavour. Have you found your bacon to be bacon-y enough for you? I would love to try a batch without nitrite as it is very difficult to come across in Canada and my butcher let me have some for my first two batches. I have two strategies for slicing bacon thin: use a meat slicer and/or cooling the bacon until it’s firm (almost frozen). This allows for thinner slices and more precise cutting. 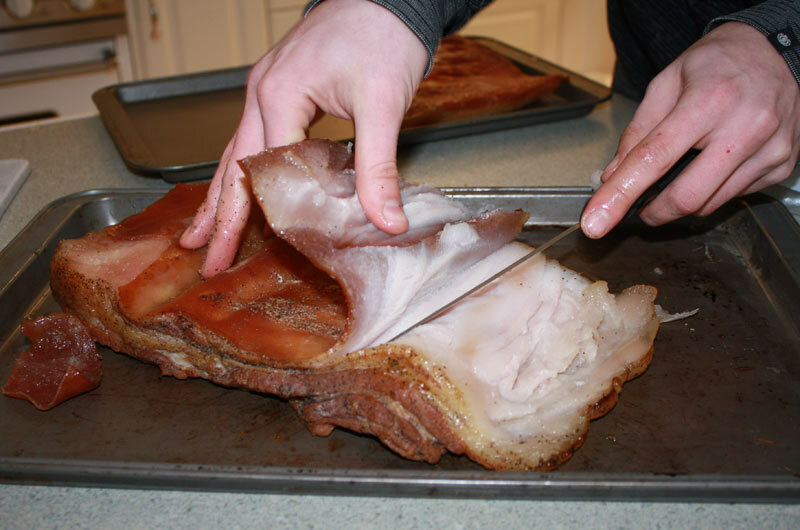 Additionally, if the pork belly or shoulder is too thin, slicing it at an angle will allow for wider strips of bacon. In terms of nitrites, the bacon does taste a little more like porkchops or ham, but it’s still really good. Nitrites keep the meat looking “pink” after cooking it, which is what we’ve grown accustomed to. Additionally, it does have a certain taste that some might consider crucial to a “bacony” flavor. However, the maple and brown sugar batch I made recently is out of this world. It cooks white like regular pork but it tastes like bacon, ham, and porkchops had beautiful, delicious babies.